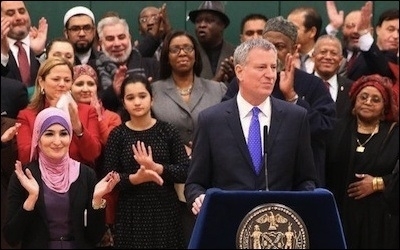 Left: Islamist Linda Sarsour, in the pink hijab, applauds as Bill de Blasio outlines his policy. Fulfilling a campaign promise, Mayor Bill de Blasio has announced that New York City public schools will close for two Muslim holidays. The next academic year will start a day earlier to make room for Eid al-Adha, the festival of sacrifice, on September 24; Eid al-Fitr, marking Ramadan's end, now falls during the summer but will eventually drift into spring. Several school systems observe Islamic feasts, and activists had long targeted New York due to its size, symbolism, and demographics (about 10 percent of students are Muslim). Framing the move as "a matter of fairness," de Blasio urged critics to "look at the Constitution of the United States." A 2014 essay by Muslim lawyer Farhan Memon does just that. Though public schools may close on holy days, a secular purpose like high absenteeism is needed. "New York's large Jewish population and its historic involvement in the teaching professions" support closures on Jewish holidays, Memon writes, but such a reason "does not exist" for Muslims because the number of Muslim teachers is "much lower" and students could simply be granted excused absences. "The primary effect of having Eid as a school holiday is to advance the Muslim religion, which clearly contradicts the intent of the Establishment Clause." Scheduling is also problematic. For example, Eid al-Fitr begins with a new moon, but Muslims differ on whether it must be sighted by eye. In setting a date beforehand, public schools are "endorsing one religious practice over another." No, the constitutionality is not so obvious after all. However, that has not slowed the push to create "a pecking order of religions where some receive benefits because of growing political clout." Political correctness continues to stake out new ground, but its enforcers can have trouble agreeing on what may and may not be said. Consider two episodes from the world of business. 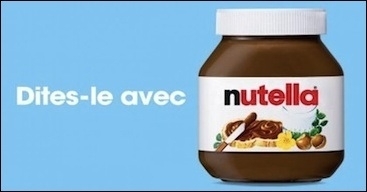 "Say it with Nutella," a promotion declares. Just don't say the wrong thing. When a French marketing campaign for Nutella offered an opportunity to design and share images of jars with personalized labels, fans quickly discovered the roster of forbidden words. Among other oddities, "Muslim" and "Jewish" were banned while "Christian" was permitted. British retailer Marks & Spencer took an alternate path, preventing "Christ" from being included in messages accompanying flowers — even as "jihad," "terrorist," and "Allah" got the go-ahead. Threats of a boycott prompted the store to apologize and give Jesus a belated seal of approval. Ferrero, the company behind Nutella, and Marks & Spencer voiced worries that certain words could be used to offend, but is it more offensive to let a word be written or to prohibit it altogether? And precisely which terms are on the ever-shifting verboten list? At its worst, such confusion results in the fear of saying anything at all. Limited to the realm of bouquets and hazelnut spreads, this is an annoyance. But if that same fear impedes honest discussion of faith in an age of global conflicts animated by religion — and one religion in particular — we risk catastrophe. Related Topics: Muslims in the United States | David J. Rusin receive the latest by email: subscribe to the free mef mailing list This text may be reposted or forwarded so long as it is presented as an integral whole with complete and accurate information provided about its author, date, place of publication, and original URL.